If you’re invited to a Chinese home for a meal and you sit down at the dinner table and find yourself eyeball to eyeball with a fish you should be pleased! If a whole fish, a Chinese sign of prosperity, is served at a banquet, it’s customary to point it at the guest of honour. You may then be expected to help yourself the Chinese way, using your chopsticks to pull off pieces of fish, or, if you’re more fortunate, someone may serve it to you, using two spoons to dish it up. Mix together the sherry, sugar, salt and sesame oil. Finely chop the onions.Get your wok ready for steaming. 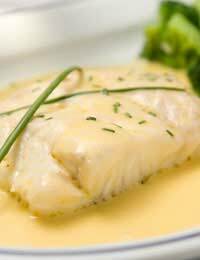 Place the fillets on a heatproof dish that will fit inside your steamer and pour the sherry mixture over the fish. Sprinkle the chopped onion on top.Steam for about 10 - 15 minutes or until the fish flakes easily. Serve garnished with chopped coriander and lemon wedges. Beat the eggs with the salt until frothy. Fry the celery and mushrooms lightly for 2 -3 minutes then remove from the pan and mix in with eggs, prawns, bean sprouts and water chestnuts. Using a small frying pan pour in about ¼ of the mixture and tilt the pan so it covers the bottom. Cook over medium heat until the underside is golden-brown. Turn over and brown the other side. Repeat this procedure for the remaining 3 omelettes. Using a small saucepan bring the chicken stock to the boil. Add the soy sauce, sherry, oil and pepper. Mix well. Make a paste from the cornflour and water and add, stirring, to the sauce. Continue until the sauce thickens and clears. Serve warm with the omelettes. Heat the oil (you’ll need about 1 litre for deep frying) in your wok or a deep fryer to 350oF (175oC). Add the garlic and allow to cook briefly - but don’t let it burn - then remove from the pan. Add the fish cutlets and deep fry until brown. Remove and drain. If you’ve used a wok for deep frying, now remove most of the oil, leaving just enough to fry the ginger, chilli and garlic until softened. Return the fish to the pan along with the stock, soy sauce, sherry and sugar. Simmer over a low heat for about 15 minutes or until the fish is cooked through. Remove the fish and keep warm. Add the vinegar, spring onions, a few drops of sesame oil and the cornflour paste to the liquid left in the wok. Bring to the boil and simmer, stirring, until the sauce thickens and clears. Serve poured over the fish.You can, of course, oven-bake your fish cutlets for a healthier version of this dish.